Singer helped arrange meeting with a Russian lawyer and Donald Trump Jr.
GEORGE STEPHANOPOULOS: Emin, thank you for joining us. And start out by just telling us why you've decided to speak out now. 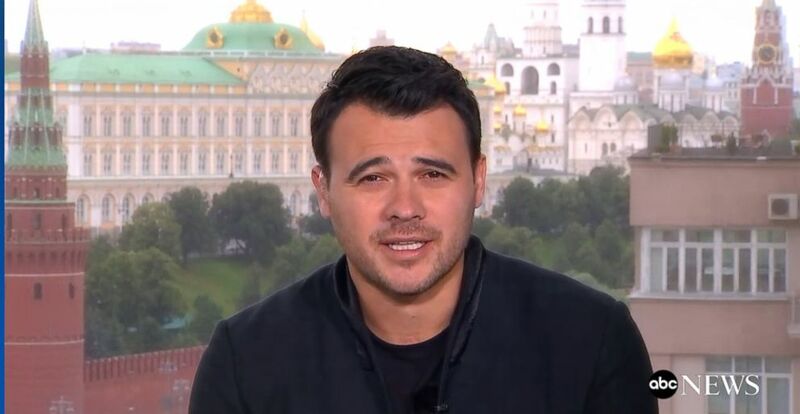 EMIN AGALAROV: My pleasure. Hello everybody, by the way. I decided to speak out now because I actually have, at last, finally, my new single called Got Me Good out. So-- it's time to talk and to discuss it. GS: And tell us about that video. You seem to be mocking-- the investigations going on here in the United States about Russia meddling in our election. EA: Well-- in the past year, I've been hearing my name in the news in-- in the most ridiculous, craziest-- scenarios. So basically, everything that I've memorized I put in a collage of a video-- everything -- to do with -- President Trump and Hillary Clinton and Mark Zuckerberg and passing secret documents and being involved in the election. All those acquisitions, which are crazy by the way, are now in the three minute -- video called Got Me Good. 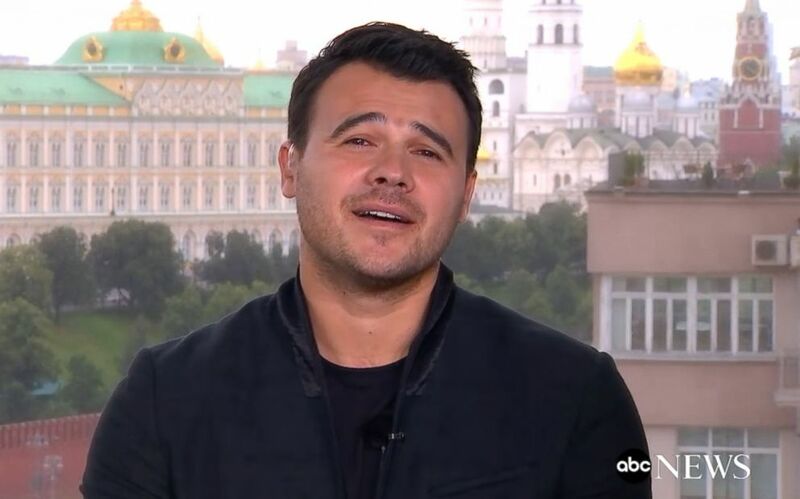 (ABC News) George Stephanopoulos interviewed Emin Agalarov, who helped arrange a key meeting at Trump Tower between high-ranking members of the Trump campaign and Russians. GS: Well, let's try and dig into some of those questions right now. First of all, Donald Trump first appeared in one of your-- your music videos back in 2013-- during the Miss Universe Pageant-- in-- in-- in Moscow. Tell us about how that came to be. EA: Well, I was in New York at the time-- working on my new single-- the song called Amour. And we decided to find the most beautiful girl in the world to be in the video. And she happened to be Olivia Culpo, at the time she was the current Miss Universe that-- belonged to Mr. Donald Trump-- organization. And -- after having shot the video and met the-- Olivia and met-- met Miss Universe and the director of Miss Universe, they introduced me to Mr. Trump. And eventually, we brought Miss Universe to Moscow in 2013 to host the biggest-- event of that year here-- with 87 most beautiful girls from all over the world. And Mr. Trump came himself. And while he was here, I decided to-- to try-- and I asked him-- I said, "Mr. Trump, would you take part and me in my music video?" He said, "How long is that gonna take?" I said, "Ten minutes?" He said, "I'll do it." So it's, like, 7:00 a.m. before we both went to work-- on the-- on the day of the show. He -- he fired me in the video. He said, "Emin, you're fired." And he does that really well. GS: It's all been reported that on that trip you offered to send women up to Mr. Trump's hotel room, is that true? EA: No, completely untrue and-- mainly-- I think-- it's important to remember that he had 87 of the most beautiful women in the world with him at the time. So he had Miss Britain, Miss Australia, Miss Austria, Miss U.S.A., Miss-- et cetera, etcetera, etcetera. So I wouldn't even risk to offer that. GS: So Keith Schiller, the president's bodyguard at the time, said that someone made that offer. It wasn't you? EA: It definitely wasn't me or anybody I know. GS: Let's -- let's talk also about the Trump Tower meeting. Of course, that's why you've been in the news more than anyone else, that June 2016 meeting-- Trump Tower meeting. When-- and Rob Goldstone, who was your publicist at the time, sent that-- famous e-mail to Donald Trump Jr. saying, "Emin just called and asked me to contact you with something very interesting. The Crown Prosecutor of Russia met with his father Aras this morning and in their meeting, offered to provide the Trump campaign with some official documents that would incriminate Hillary in her dealings with Russia and would be very useful to your father, very high-level sensitive information." Tell us the story behind that e-mail. Why did you tell Rob Goldstone to contact Don Jr.? EA: George, the thing is, there's a criminal investigation currently going on, and I think more than one. So I think it would be inappropriate for me to-- to comment on that. GS: But you did -- you did direct Rob Goldstone to try to set up that meeting, correct? EA: George, I don't think it's appropriate for me to comment on that. GS: Have you talked to Robert Mueller or the F.B.I. about that? GS: You have not been contacted by Robert Mueller? EA: I'm not gonna talk about this. But I haven't spoken to him. GS: Well, of course, that is the reason you've been in the news, that is the reason why you have that video-- made-- as well. This is obviously of high interest here in the United States. Are you not answering because you fear some kind of legal exposure? EA: No, I'm not ans-- answering simply because it's-- it's an investigation. As far as I know, I think it's a criminal investigation involving the current president of the United States. I definitely don't wanna be any part of that. GS: But you are part of it, aren't you? EA: -- in the United States or -- or in any other country? GS: Well, because you had a relationship with Mr. Trump, your father had a relationship with Mr. Trump as well. And between 2013 and that meeting in Trump Tower in 2016, were you or your father involved in any other real estate or other business dealings with Mr. Trump or his family? EA: None whatsoever. At some point, we had a discussion of building a Trump Tower in Moscow. It was actually my idea. My father is also a big developer here and -- we were planning to build -- an (UNINTEL PHRASE) tower. And next to it, I said, "Dad, it would be cool to have a Trump Tower, so let's open the discussion." We didn't-- it never led anywhere. So our only-- connection, relationship with-- Mr. Trump and his family was -- organizing -- a beauty pageant in Moscow. So-- and we've done it, it was super successful, we were happy we've done it. We've met-- Mr. Trump. I think he's amazing on a personal level-- and so is his family. And-- and that was it. There was nothing to it. And-- it-- it was never political, we never really did any business, except for the pageant together. And it limits to-- to only the beauty pageant. So how could two guys or three guys organize a beauty-- beauty pageant and evolve into something so political in the end? I mean, it's-- it just sounds crazy. EA: But who wouldn't? George, who wouldn't? He's an amazing man? Why would you not keep up a relationship with him if you can? GS: But then to follow on with that question, he starts to run for president and your father believes there is information from the Crown Prosecutor of Russia damaging to Hillary Clinton and you try to set up -- this meeting. I'm just trying to ask you to explain what happened there. EA: George, again, this is you coming back to the question that I'm not gonna comment on because it's-- it's an-- an investigation and I'm not gonna comment on it. GS: Are-- are you concerned that if you come back to the United States you will face a subpoena-- from-- Mr. Mueller or the F.B.I.? EA: I wouldn't know-- if I should be concerned or not. But-- I do have a tour planned next year-- around the United States. And I-- I go on tours-- in America quite often, every two years or so. So-- hopefully, I'll see all my fans there in the early of 2018, I believe. It's '17 now? 2017? GS: It's actually 2018 now. EA: Oh, you see, I'm lost in time. 2019. GS: -- you also had phone calls -- two reported phone calls showed up on the record -- with -- with Don Jr. I-- I-- I know you're trying-- I guess to sort of have it both ways. You want the promotion for your video, but you don't wanna answer the questions that have been the reasons the video is getting so much-- attention. What did you talk to Don Jr. about at that time and do you know if he spoke with the president about this meeting? EA: I wouldn't know if he spoke with the president. And I've spoken to Don Jr. a few times in my life-- over the phone. And I can't-- at this point, I can't recollect-- if I don't even remember what year it is right now, when and about what have I spoken to him at three or four years ago. GS: Also after the election-- you kept up the relationship after the election, text messages with Don Jr., both after the election and during the transition. What were you hoping to achieve? EA: I don't think we kept in touch -- not -- I might be mistaken, but I don't think we've-- kept in touch with the president or with-- Don Jr. after the election. EA: -- (UNINTEL PHRASE) to Mr. Trump. GS: There was -- there were text messages between you and Don Jr. during the transition after the election. EA: Possibly. And what were they-- what were the messages? GS: That's what I'd like to know. You tell us. GS: -- were you trying to come to the inauguration? EA: No, of course not. I -- I -- that's something I'm very apolitical, so-- an inauguration would be a lot of waiting time, a lot of security, a lot of -- issues that I'm not really, you know, excited about. So I wouldn't-- wouldn't wanna be there. GS: I take you at your word when you're saying you're apolitical. But the reason-- you-- you've gotten so much attention, of course, is because you tried to set up that meeting. Why was it so important to your father-- to-- have this meeting set up? EA: I have no idea. It's probably a question you should ask my father. EA: I can hook you up, George. GS: I -- I will -- I will take that any time, Moscow or New York, anytime, anyplace. GS: But just -- just -- just to -- just to nail this down-- are you confident that -- you will not be caught up in the investigation by Robert Mueller and the F.B.I. here in the United States? EA: I have no idea. How could I be confident of that? GS: And you are-- and can you explain why you were promoting the Trump campaign on social media in Russia? EA: I was promoting Trump's -- campaign on social media? I was never promoting Trump's campaign. The only thing I've done a few times and-- I would still do it. And I -- I said that Trump is an -- Mr. Donald Trump is an amazing human being and I wish for him to become the president of the United States, that's it. GS: Emin, thanks for joining us this morning.